Register today for the 2018 PRSA Southwest District Conference! 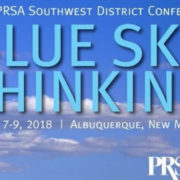 Join New Mexico PRSA and members from 13 chapters in the SW District for the 2018 PRSA Southwest District Conference March 8 and 9 in Albuquerque! In addition to the main conference, two limited-space pre-conference sessions will be held on March 7. More than 20 speakers will cover a myriad of relevant industry topics including crisis communication, storytelling, digital marketing, social influencers, workplace dynamics, accreditation and more. Keynote speakers include Tony D’Angelo, APR, Fellow PRSA and National Chair, PRSA. https://fortworthprsa.org/wp-content/uploads/2018/01/unnamed-1.jpg 315 525 Hannah Lacamp http://fortworthprsa.dividesignpros.com/wp-content/uploads/2019/01/GFWPRSALogo2018-300x287.jpg Hannah Lacamp2018-01-26 16:48:012018-01-26 16:48:01Register today for the 2018 PRSA Southwest District Conference! Join us for our next GFW PRSA luncheon on Wednesday, February 14, at Colonial Country Club! Crises can happen to any organization at any time, and in a world where anyone with a smartphone can become a “journalist,” it’s important for you to control the narrative. What happens next? 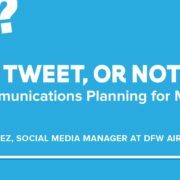 Dallas Fort Worth International Airport social media manager John Valadez’s first step is always to consult the established and practiced crisis plan. Learn how you can prepare for any crisis, and why organizations like the Airport have a social-first crisis program. https://fortworthprsa.org/wp-content/uploads/2018/01/PRSA-February_2018_Page_2.jpg 1189 3334 Hannah Lacamp http://fortworthprsa.dividesignpros.com/wp-content/uploads/2019/01/GFWPRSALogo2018-300x287.jpg Hannah Lacamp2018-01-19 10:15:092018-01-19 10:15:09Join us for our next GFW PRSA luncheon on Wednesday, February 14, at Colonial Country Club!